Last year, antifascists in Poland commemorated the country’s international brigades on the eightieth anniversary of the Spanish Civil War. Their gathering came under attack and a smoke grenade was thrown through the door. Inscribed on the projectile was the phrase “ha pasado,” “we have passed,” Franco’s retort to Dolores Ibárruri’s “no pasarán” on the day the Republic fell. Another iconic turn of phrase associated with the civil war owed much to Poland’s influence. “A las Barricadas,” the anthem of the anarcho-syndicalist CNT federation, became the war’s most famous song — but it wasn’t exactly an original. Its tune had been written by Józef Pławiński and its lyrics by Wacław Święcicki, both Polish socialist musicians. Their “Warszawianka” had been the anthem of the 1905 Polish Revolution, when worker militias sought to overthrow the Russian imperial government. But, for a park about dictatorship, it has an interesting lineup. Alongside monuments to politicians from the Communist period — and Marx, Engels, and Lenin — stand those left-wingers from generations earlier. There are commemorations for figures from the short-lived 1919 Hungarian Soviet Republic, including Tibor Szamuely and Jenő Landler, as well as Ede Chlepkó and Béla Kun, who were executed in Stalin’s purges. Róbert Kreutz and Endre Ságvári, killed by the Nazis and Hungary’s fascist government during World War II also have statues. They are joined by Miklós Steinmetz and I.A. Ostapenko, Red Army captains who died liberating Budapest from German occupation. And, of course, there’s a memorial to the Hungarian international brigade to Spain. Unfortunately, it is no surprise that initiatives which purport to challenge dictatorship are instead demonizing those who struggled against fascism. Decommunization has become a tool for resurgent nationalist movements to rehabilitate their own record — one which often involved Nazi collaboration. In 2015, riding a wave of nationalist sentiment in the wake of conflict in the country’s east, Ukraine began an intensive process of decommunization. Since then thousands of streets and hundreds of towns have been renamed, statues of Lenin have been torn down in every corner of the country, and political parties which are deemed too sympathetic to the Communist past have been banned — including the Communist Party of Ukraine, which regularly received millions of votes. The legislation that Ukraine’s Parliament voted on wasn’t exclusive to Communism. Its text promised to combat celebration of both “Communist and National-Socialist totalitarian regimes.” But in 2015, as these measures passed, Ukraine’s government was in fact institutionalizing fascist militias into its armed forces. That summer the Azov Battalion, founded by members of the neo-Nazi Social-National Assembly, was officially upgraded to a Special Operations Regiment of the Ukrainian Army. Its members celebrated with photos showing their SS tattoos, symbols which the government was supposed to have banned. The institutionalization of fascism isn’t confined to the military. The country’s far right is increasingly prominent in official history as well, part of a state-sponsored revisionist project designed to venerate Ukrainian nationalism. The most high-profile figure to be rehabilitated is Stepan Bandera, the nationalist leader who collaborated with the Nazis during the Second World War and whose Ukrainian Insurgent Army participated in the Holocaust. But Bandera is far from the only figure to undergo such a rebranding. 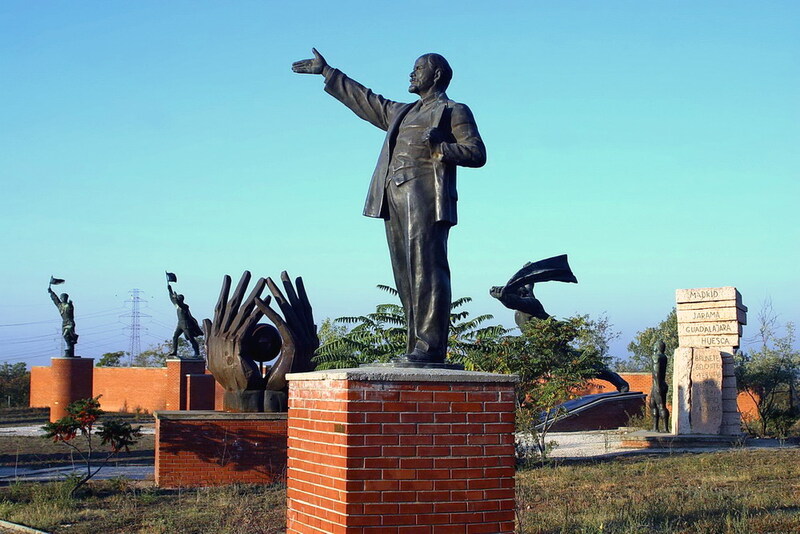 In October 2017 the Ukrainian city of Vinnitsa unveiled a statue to Symon Petliura, who led an anti-communist uprising against the Bolshevik Revolution. Under his reign, fifty thousand Jews were killed in pogroms in the Ukrainian People’s Republic. This isn’t a record that the city is hiding from — local authorities ultimately decided to place his statue in the city’s historic Jewish quarter, a short walk from one of the few remaining synagogues. The Soviet Union’s record in Eastern Europe was bleak — its population transfers, political repression, and forced collectivizations contribute to much lingering resentment. But the drive to decommunize has little to do with building a more democratic society. It’s, at its heart, a project designed to rewrite history, forgiving fascism and condemning those who fought it. Hungary: The End of Democratic Illusions?